Long before the word “genocide” was coined, the British invasion of Australia had annihilated approximately nine-tenths of the continent’s original population of Aborigines. The creation of white Australia depended upon the legal fiction of “terra nullius”—no man’s land—the claim that Aboriginal lands were inhabited by people who would soon die out and who could be helped on the way to extinction if they lingered. 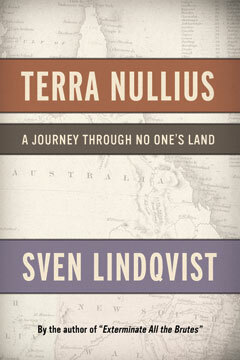 Sven Lindqvist, the widely acclaimed and internationally renowned author of “Exterminate All the Brutes” and A History of Bombing, brings his original sensibility to bear as he travels 7,000 miles through Australia in search of places where belief in the rights of the white man and the annihilation of the “lower races” were put into practice. While Australia continues to reckon with its violent past—echoed in the United States’ treatment of Native Americans and Europe’s colonization of other continents—Lindqvist evokes a shocking history in which young boys were kidnapped to dive for pearls, then whipped and abandoned when the bends ruined them for work; “half-caste” children were taken from their mothers; and natives were misdiagnosed with STDs, put in neck irons, and sent to internment camps on remote islands. Lindqvist also recalls the work of ethnologists who brought their own prejudices to bear in studying Aborigines as primitives close to the origins of civilization, later inspiring Freud and Durkheim. At the same time he describes a beautiful and strange land, sacred to the native people who had inhabited it for centuries and celebrated in a long tradition of richly symbolic art. A movingly idiosyncratic travelogue and a powerful act of historical excavation, Terra Nullius is the illuminating and disturbing story of how “no man’s land” became the province of the white man.